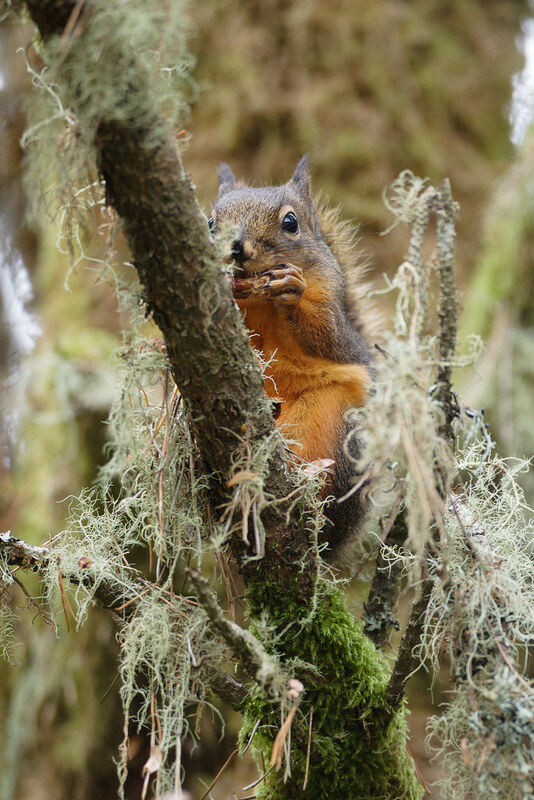 A Douglas’ squirrel chews through the outer part of the cone to get to the seed underneath, like we would eat corn on the cob except that we are interested in the corn not the cob. A lovely little squirrel, and native too. Taken at Leadbetter Point State Park on the Long Beach Peninsula in Washington. 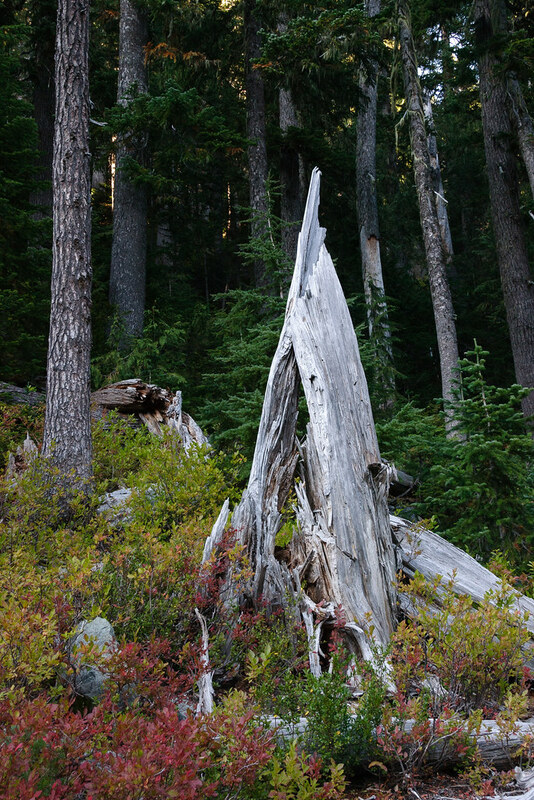 While hiking the Summerland Trail in Mount Rainier National Park, I came across this rocket being built by the animals of the forest. Looking good! 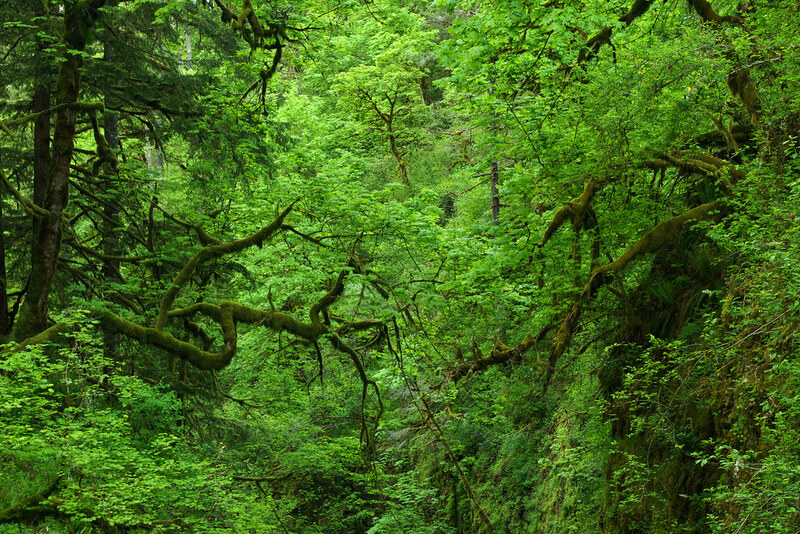 Moss-covered trees reach out their hands across the chasm that is the Oneonta Gorge. I washed my wife’s car on Monday morning, its lovely green paint shining in the sun, but this is how it looked Tuesday morning. 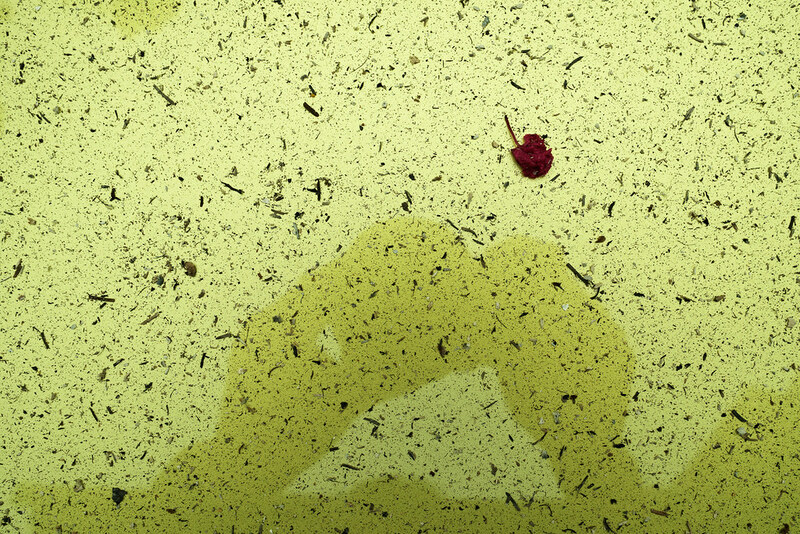 A bit of a bloom from the crepe myrtle above the driveway had fallen onto the hood, where it was surrounded by the charred remains of trees in the Columbia River Gorge, ash that had been drifting down throughout the evening and night. A fire started on the Eagle Creek trail over the Labor Day weekend, possibly by teens setting off fireworks, and with high winds and a parched forest it soon spread to other parts of the Gorge, including several areas I’ve been hiking this year and will be back visiting soon. Walking to the train this morning in our Portland neighborhood the sun was deep red even well after sunrise but by evening when I returned home you couldn’t even see the sun so thick was the smoke in the air. 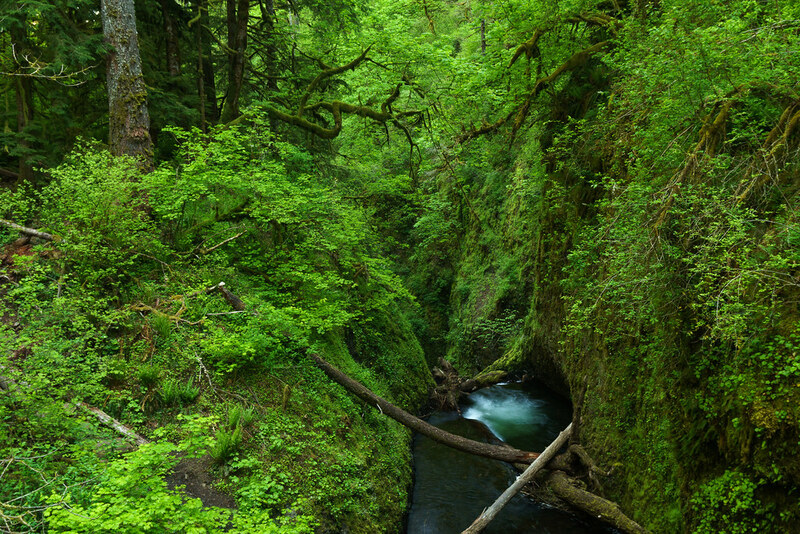 It’s too soon to know the extent of the damage to the forests and the trails as the fire is still raging, but this is the sort of area that is burning, looking down into the Oneonta Gorge, taken on a hike in the spring when everything was a luscious green. Move away from the mountain streams and much of the surrounding forest is not so damp, especially not after such a hot dry summer. My thanks to all the firefighters trying to contain the blaze and protect the historic structures and the small communities in the area, and who led about 150 people trapped on the Eagle Creek trail by the fire to safety. 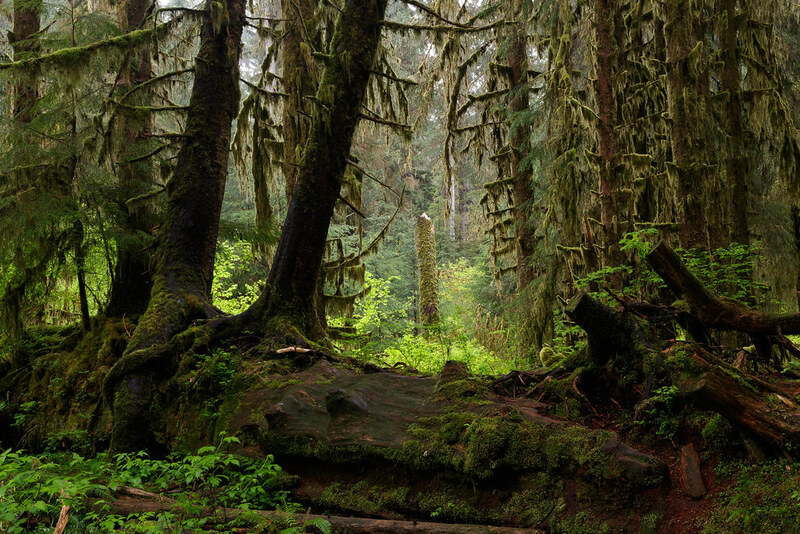 Long ago a large tree fell over beside the Hall of Mosses Trail in the Hoh Rain Forest, forming a nurse log for younger trees to grow on. Some of those younger trees fell too and the park staff cut them with chain saws, they were probably blocking the trail, and behind them in the clearing you can see a tree that has naturally broken partway up the trunk. This will provide even more light into the clearing, allowing different types of plants and trees to grow before old giants eventually rise up again. 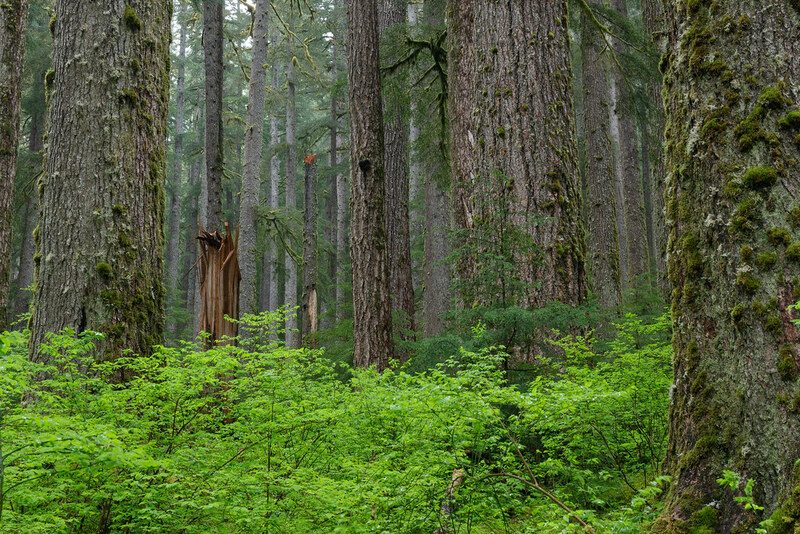 A simple portrait of the forest on a rainy day on the Sol Duc Falls Trail in Olympic National Park. It was really chucking it down at times and the polarizer on my lens had gotten blurry from the water and I couldn’t get it clear, yet I couldn’t get it to unscrew from the lens, so many pictures weren’t usable. Doesn’t matter, it was still great to be there, just being in a forest like this restores me. Even the trees that have died, broken, fallen over, are giving life to the sea of green that rises up in the open spaces. Many of these trees though will have lifespans that dwarf mine, if we’ll give them the chance. 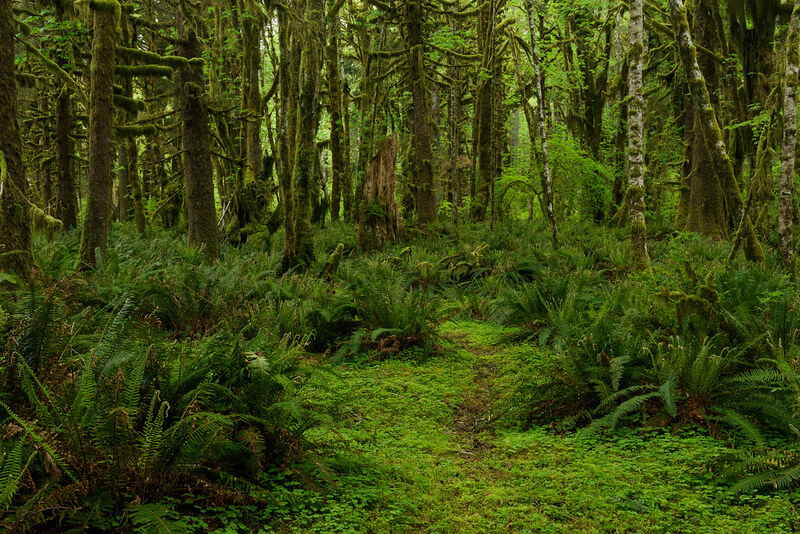 While I love the old growth sections of the rain forest with its massive trees, I love the younger forest too reclaiming this little section of the Olympic peninsula in the Quinault Rain Forest. 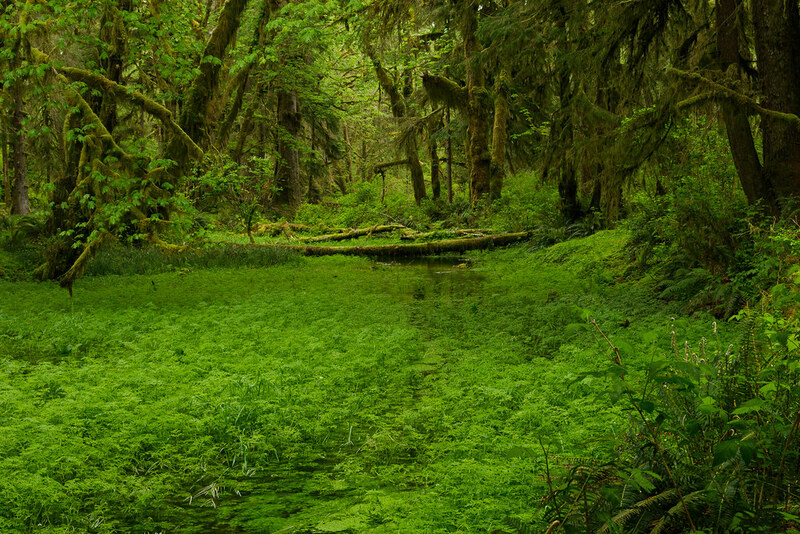 I stood beside this meandering stream, swimming in a sea of green, a smile on my face. A little ways away young trees grew, covered in moss of course because this is the rain forest, while ferns grew in the open spaces below. Ferns whose ancestors first appeared hundreds of millions of years ago, before the flowering plants, but some of which have survived through to today. Some of which I grow in my yard, wood sorrel too, my little reminder of the forests that hold my heart.